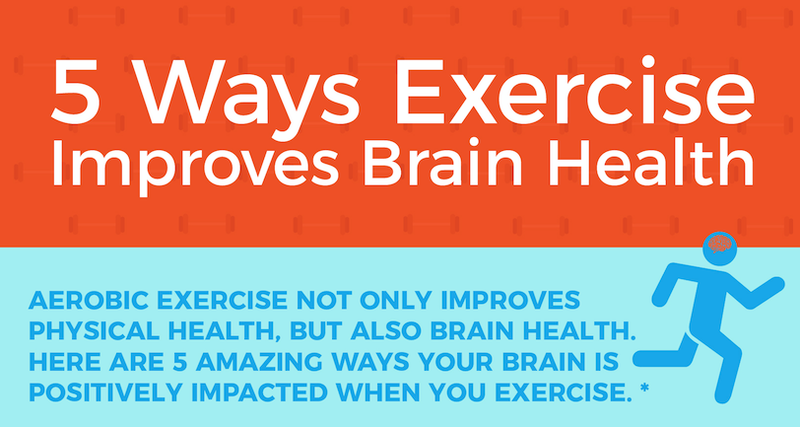 We all know that exercise is good for your health, but did you know it’s also good for your brain? Recent research studies show that aerobic exercise may benefit those with mild cognitive impairment, a condition that may lead to Alzheimer’s disease. A study at Wake Forest School of Medicine found that participants who used a treadmill or biked four times per week over a six-month period saw an increase in volume. 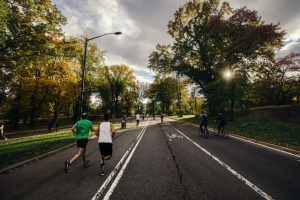 “Even over a short period of time, we saw aerobic exercise lead to a remarkable change in the brain,” said the study’s lead investigator Laura D. Baker of Wake Forest School of Medicine. Talk about sweat equity! View the full-size graphic at the bottom of this page. 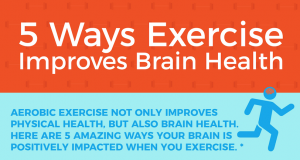 Physical exercise promotes the release of ‘feel good’ chemicals in the brain. Endorphins, dopamine, norepinephrine, and serotonin are released during exercise and create a feeling of contentment and satisfaction. This feeling is sometimes referred to as a runner’s high. These chemicals also act as mood stabilizers. Regular exercise also helps balance your body’s level of stress hormones, such as adrenaline. A study at the University of British Columbia, found that regular aerobic exercise appears to boost the size of the hippocampus, the brain area involved in verbal memory and learning. Resistance training, balance and muscle toning exercises did not have the same results. In yet another study, this time at the UC Davis Health System, results found that intense exercise increases levels of two common neurotransmitters — glutamate and gamma-aminobutyric acid, or GABA — that are responsible for chemical messaging within the brain. If you’d like to take advantage of the brain benefits associated with exercising, use the research study parameters to make the most of it. Incorporate aerobic activity for at least 120 minutes spread throughout the week. Doctors recommend 30 minutes of brisk activity daily, or 150 minutes per week. If exercise is new to your routine, consider starting with a few minutes each day and gradually increasing it by 5 to 10 minutes each week until you hit your goal. Brisk activities include walking, swimming, tennis, dancing, and a variety of other activities. Get creative with it and mix up your routine to keep you on track. Your body and brain will thank you for it. In addition to physical exercise, some organizations tout brain games and brain training to improve mental fitness and plasticity. While the research to date is relatively limited and inconclusive, scientists note that maintaining a healthy diet and heart will help with brain health. And while brain games and training certainly won’t hurt anything, they may not contribute to overall brain health. “Stay physically and mentally active doing the activities that you enjoy. For example, if you enjoy reading and playing crossword puzzles, do that,” said Cyrus Foroughi, a cognitive scientist at the United States Naval Research Laboratory. At Northwest Primary Care, your overall health and well-being are important to us. To learn more about your mental well-being or starting an exercise program, contact one of our care providers.